Sisters Creekside Campground just blocks from downtown Sisters, is a municipal park which offers a total of 60 campsites including 27 full hook-up sites plus a separate “hiker/biker” area. 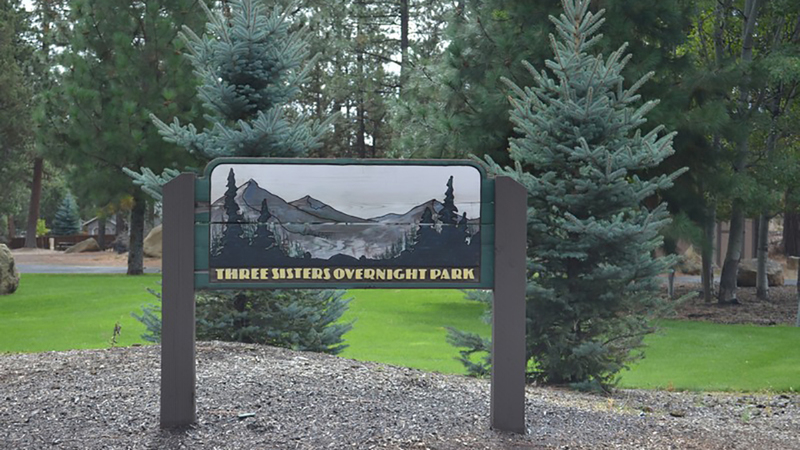 With restrooms and coin-operated showers as well as an automated sewer discharge site, each site is equipped with a fire pit and a picnic table. Situated along Whychus Creek, a covered footbridge spans the creek and leads to Creekside Park. The campground has one full hook up ADA site reservable with a handicap parking permit. There are six people and two pets maximum per site, and a three-night minimum stay is required for the following event weekends and must include Friday through Sunday: Sisters Rodeo (June), Sisters Outdoor Quilt Show (July), and the Sisters Folk Festival (September). Note: The Hiker/Biker area has a bike rack, picnic table, fire pit, and water spigot with a maximum stay of two nights. Open from April through October, campground reservations are available online for May through October, with no reservations for the month of April, as it is first-come-first-serve.